Sebastian, regarded at the top researcher in the field of diet-related acidosis, admits that some of the science, at first glance, appears counter-intuitive. For example, acidic and alkaline foods don't usually translate into acid- and alkaline-yielding foods. The distinction is subtle but significant. An acid-yielding food is one that creates a lower, or more acidic, pH. Citrus fruits and tomatoes are acidic, but they have a net alkaline yield once their constituents get to the kidneys. 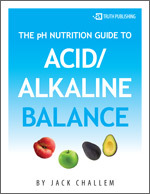 So if acid foods don't necessarily make for an acid pH, what then happens? Sebastian points to four big issues. • First, fruits and vegetables are rich in potassium salts, a natural buffer. Eating few of these foods deprives us of potassium, a mineral that protects against hypertension and stroke. According to Cordain's research, humans evolved eating a 10:1 ratio of potassium to sodium, and he regards this ratio as our biological baseline. Today, because of heavily salted processed and fast foods, combined with a low intake of fruits and vegetables, the ratio is now 3:1 in favor of sodium. That reversal, he says, wreaks havoc with pH and our dependency on potassium. • Second, there has also been a similar reversal in the consumption of naturally occurring bicarbonate (such as potassium bicarbonate) in foods and added chloride (mostly in the form of sodium chloride, or table salt). Bicarbonate is alkaline, where as chloride is acid-yielding. Chloride also constricts blood vessels, and narrows blood vessels reduce circulation, Sebastian says. Because the whole body depends on healthy circulation, vasoconstriction contributes to heart disease, stroke, dementia, and probably every other degenerative disease. • Third, eating large amounts of animal protein (including meat, fowl, and seafood) releases sulfuric acid though the metabolism of sulfur-containing amino acids, also contributing to greater acidity. This acidic shift can be offset with greater consumption of fruits and vegetables (rich in potassium bicarbonate), but again, most Americans eat these foods sparingly. • Fourth, grains, such as wheat, rye, and corn, have a net acid-yielding effect, regardless of whether they are in the form of white bread, breakfast cereal, pasta or whole grains. "Grains are the most frequently consumed plant food in the United States," says Sebastian, and account for 65 percent of the plant foods eaten by Americans. "In addition to their acid yield, grains displace more nutritious fruits and vegetables," he adds. "The real problem is one of alkaline deficiency, more than one of too much acid," says Sebastian. People eat plenty of acid-yielding animal protein, dairy products, and grains. The missing piece is an appreciate amount of fruits and vegetables, to produce an alkaline yield. Study after study has shown that most Americans -- 68 to 91 percent -- don't eat the five recommended daily servings of fruits and vegetables.